Should You Give Your Kids Low Fat or Whole Milk? Milk, in one form or another, is a big part of your child's nutrition. It is a good source of calcium, vitamin D, and protein. In fact, depending on their age, most kids should drink between 2 and 4 glasses of milk each day, especially if they aren't eating or drinking any other calcium-rich foods, such as yogurt, cheese, or calcium-fortified orange juice. The only problem is that whole milk has a lot of fat in it, especially as compared to low-fat milk and nonfat milk. This extra fat is especially concerning considering the childhood obesity epidemic we are currently trying to deal with. Fortunately, it isn't too hard to figure out which kind of 'milk' to give your newborn and younger infant, as most parents know to give them either breast milk or an iron-fortified infant formula. Most parents also know to switch to whole milk once their baby is a year old, or after that, once they decide to wean from breastfeeding. When to switch to low-fat milk is a little more confusing for many parents, though. Traditionally, the American Academy of Pediatrics recommended that all children switch to low-fat milk once they were two years old. Younger toddlers who weren't breastfeeding were supposed to drink whole milk. That changed with a 2008 report on "Lipid Screening and Cardiovascular Health in Childhood," when the AAP issued a new recommendation that reduced-fat milk might be appropriate for some children between the ages of 12 months and 2 years of age if they are already overweight, or if they have family members who are overweight or have high cholesterol, etc. Whole milk is a good option for toddlers over age 12 months who aren't breastfeeding and who aren't drinking a toddler formula. According to the AAP, these "young children need calories from fat for growth and brain development," and "this is especially important in the first 2 years of life." 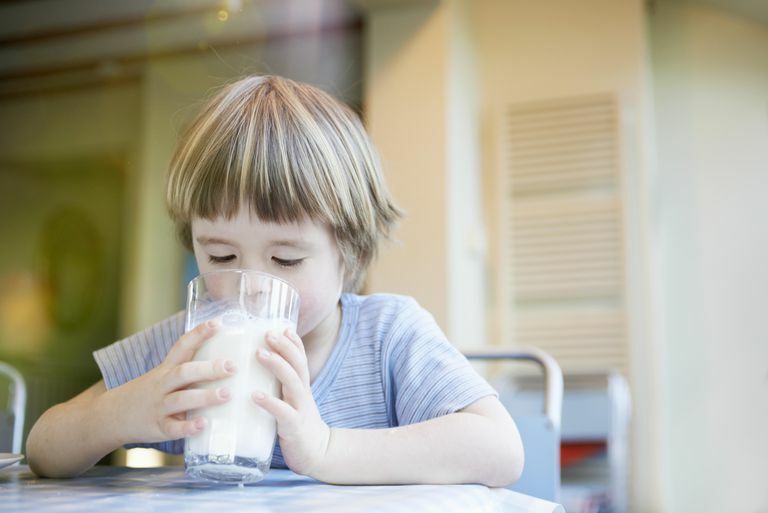 The only other real benefit of whole milk over low-fat milk is that many people do think it tastes better, so for kids who don't get used to low-fat milk and simply refuse to drink it, whole milk may be the only way that they will drink any milk at all. Whole milk might also be better if you have a very picky eater who is not overweight and is simply not getting enough fat and calories from the rest of his diet. You don't want all of your child's calories to come from milk, though, so talk to your pediatrician and/or a Registered Dietician if you feel like you are in this situation. Is the difference between whole milk and low-fat milk really make that much of a difference? So if your 5-year-old goes from whole milk to 1% milk and typically drinks 3 cups of milk a day, he would save 150 calories a day. Although that doesn't sound like much, since you gain about a pound for every 3,500 calories you consume, those extra 150 calories might cost you an extra pound in body weight every 3 weeks or so (150 calories/day x 23 days = 3450 calories = 1 pound). So what should you do? According to the AAP recommendations, if your toddler isn't going to continue breastfeeding, you should switch her to whole milk once she is 12 months old. Next, switch to skim or low-fat milk at age 2 years. Make the switch earlier, at 12 months, if your child is already overweight. Making the switch at an early age is much easier than doing it when your child is older when they are more likely to notice and be resistant to switching to low-fat milk. Still, even with your younger child, you can make a gradual switch, going first to 2% milk and then later switching again, this time to 1% milk or skim milk. An early switch to low-fat milk also helps to ensure healthy habits for the rest of your child's life, as he will be more likely to continue to drink low-fat milk as a teen and adult, instead of higher fat and calorie whole milk.